As loads are removed, the pallets behind it move safely forward. Since it is a FIFO (first in, first out) system, it is ideally suited for time-sensitive products and superior inventory control. Pallet Flow Storage systems provide improved through put. Once product is placed in the system it “automatically” moves forward requiring less handling of product. Advantages: Pallet Flow Storage systems provide improved through put. Once product is placed in the system it “automatically” moves forward requiring less handling of product. 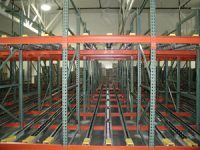 Improved density because only two aisles are required (load and unload), Pallet Flow Storage systems decrease forklift and product damage.